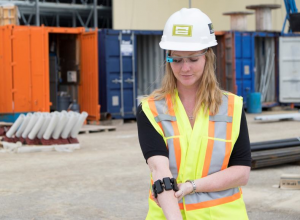 Wearables at construction jobsites? Is this some new construction fashion trend? Can we now expect to see models strutting down scaffolding? Actually, "wearables" refers to digital technology that the user affixes to a body part as opposed to carrying it. The idea behind this type of technology is that users can use data without having to use their hands. "Wearables" devices have been a science fiction staple for many decades. Considering the many ways that the technology could be applied in real life from operating rooms to the upper floors of a half-constructed building, many people were excited. Then the first wearables showed up. But instead of the sleek wristbands and eye pieces people were expecting, these devices were large and heavy. They seemed to combine all of the worst elements of ski goggles and welding masks, only they were less comfortable to wear. These first wearables were plagued by many "bugs" as well. Major problems concerned connectivity and power issues. These wearables either couldn't run very long on a battery charge or be disconnected from a power source at all. It also definitely wasn't cheap. But those were the first wearables. The only thing more dangerous than doing construction road work during the day? Doing it at night. But the Halo Light is what manufacturer Illumagear calls a "360° personal active safety system” that wraps around any hard hat. Non-wearers can see its light from a quarter mile away. And the wearer's area is brightly lit in all directions up to the edge of his or her peripheral vision. Thalmic Labs' "smart armband" Myo allows users with arm movements or gestures to conduct wireless conservations or combine images with construction software for permanent photographs and graphics. Other upcoming construction technology in 2017 to look forward to? Microsoft's HoloLens is currently being field tested by some construction firms at select sites. While still too large to be used practically, ongoing improvements are being made to this "hologram" device that allows users to see images superimposed over or beside "real life" ones. With images like the HoloLens, it's anticipated that everything from as-builts to invoices will be reviewed in the field more quickly, safely, and hands-free.